Chile is the second longest country in the world, beaten by Brazil by only a few kilometres. It’s length affords it a diverse range of climates and landscapes and it’s near impossible to see it all without setting up camp for several months. But you can get a fabulous taste of what Chile has to offer in a week, as we recently experienced. Our journey starts in Santiago where our international flight lands and connects to a domestic flight to Calama. One hour and twenty minutes later we’re transferred to the town of San Pedro de Atacama, the heart of the Atacama Desert. 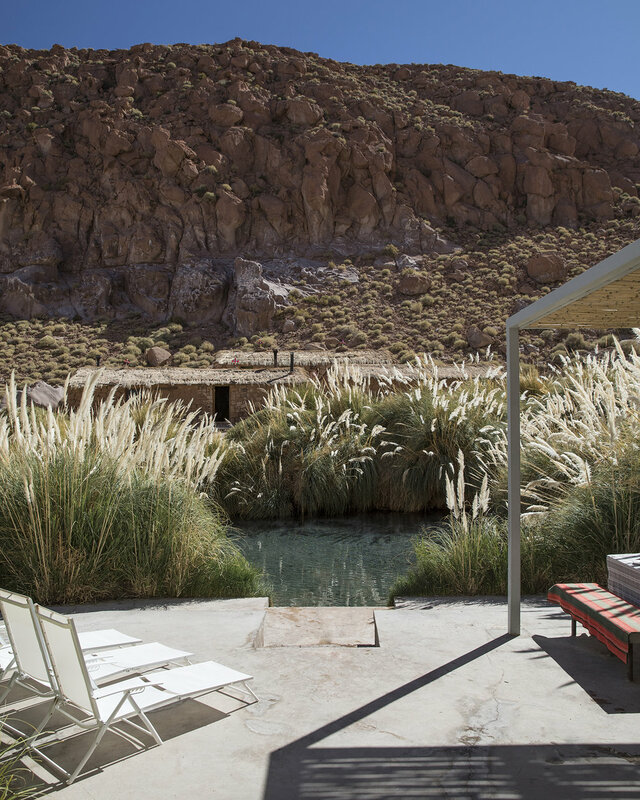 Here we check in to Explore Atacama, a white-washed estate located on 39 acres and was once owned by local Atacameño families. The lodge has been recently renovated in to an architectural masterpiece that sits nestled in its mountain surroundings. The Explora travel brand offers a unique way of travelling to remote areas in South America, centred around in-depth exploration of the surroundings combined with a luxury experience and you feel this immediately upon check-in. Weary travellers are soon at ease, as bags are whisked off to your room and you’re invited to sit in front of a roaring fire with a Chilean Chardonnay in hand. Atacama has over 40 different guided hikes, bike rides, high mountain ascents and horseback rides, in groups of maximum 8 travelers and on your first evening you discuss with the tour team various options for the following day. Once your itinerary is decided, you head to the restaurant for an exquisite three-course meal that features quinoa, mango and avocado salad, tender goat loin with creamed corn and your hearts content of dulce de leche accompanied by the best wines Chile has to offer. Your morning starts by watching the sunrise over the lodge at breakfast. The dining room at Explora Atacama boasts views of the mountain horizon and it’s stunning to watch the sun burst over the peaks and spill in to the room. After a quick bite we’re off on our first adventure. We’ve chosen to hike through a nearby valley which proves to be beautiful and challenging. The 6km hike is dotted with stops along a running stream and is a good mix of ascent and decent. It’s takes us roughly two and half hours before we finish at a Puritama Hot Springs. Operated by Explora, we are given our own private pool at the top of the spring collection and snacks and drinks are served. It’s a brilliant place to unwind after the hike, surrounded by mountain views. Upon returning to the lodge and following a leisurely lunch, we’re off for our second tour of the day to Salar de Atacama. This starts with a stop in Plaza de Tocono, a historic town with a crumbling bell tower before heading to a reserve where a colony of flamingos and other beautiful bird species reside. It’s fascinating to watch the flamingos upon the water as the sun goes down and the landscape glows. Explora Atacama has its own stables and horses, which have been bred for this particular altitude and geography of the Atacama region. It’s nice to start the day with a gentle ride in to the nearby landscape and take in the fresh air on these beautiful creatures. 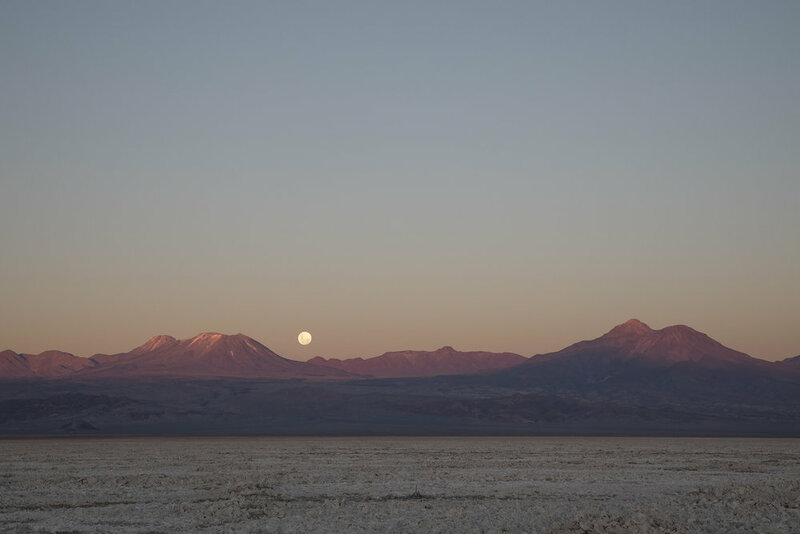 One of the best things about Chile, and Atacama in particular is that it is a year-round desintation. The desert, whilst cold in the Winter, is one of the driest desert’s in the world and offers clear blue skies and sunshine in any season. In the afternoon we book for in the infamous Valle De La Luna or Valley of the Moon. This is an easy 8km walk, which is mostly downhill or flat and particularly stunning in the late afternoon light. Starting at the top of a peak, the group walks down a steep sandbank and ventures in to a valley that is dotted with caves and salt formations. At one point we stop and can hear the salt cracking through the clay formations, like lightening bolts. The tour finishes at a peak overlooking volcanoes at sunset before heading back to the lodge for a feast. 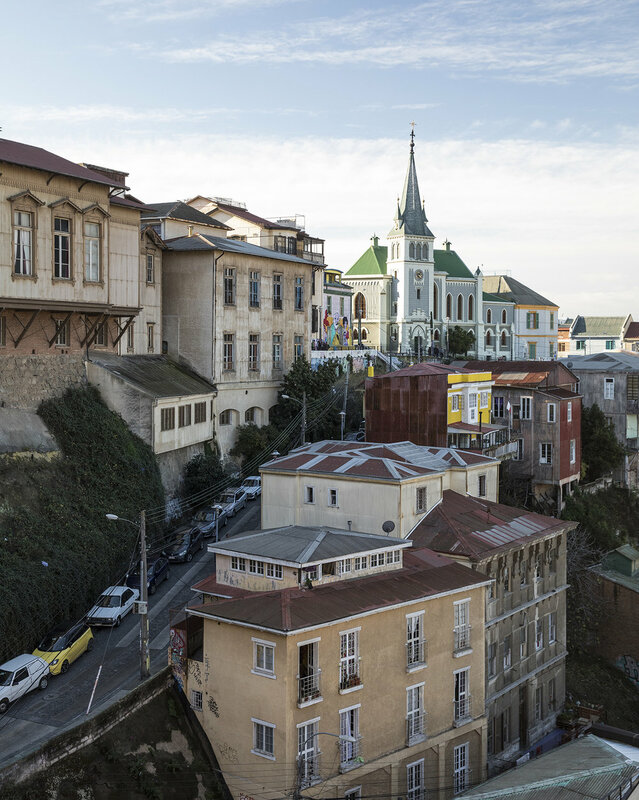 Upon check out, we make our way back to Santiago where specialist travel company Boutique South America has arranged a Mercedes-Benz transfer and beaming local guide to take us to Valparaiso. 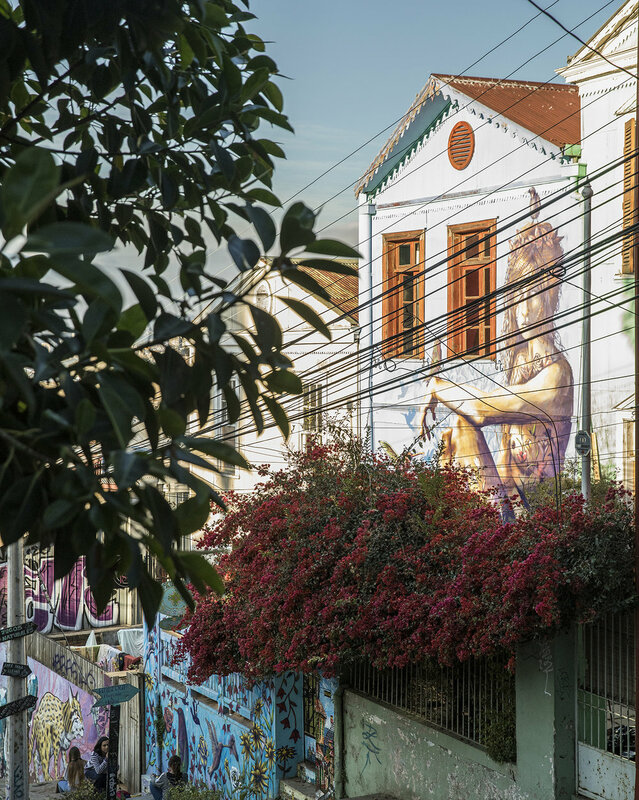 Only a short 1.5 hour drive away, Valparaiso is a city that is bursting with culture and colour and upon arrival in the afternoon it’s a charming place to wander and get lost. There’s a photo opportunity at every turn, with street art, pretty facades and boutique stores lining the streets. Valparaiso is known for it’s empanadas and they’re easily found, cooked fresh to order and filled with cheese, corn and sweet peppers. Here we stay at boutique hotel Casa Higueras which a grand house hidden at the end of a colourful street. The hotel boasts sweeping views over Valparaiso and is furnished like a chic European townhouse. Our room comes with it’s own balcony which is perfect for watching sunset over the port. Our local guide takes us around some of Valparaiso’s top highlights which starts with the picturesque farmer’s markets. This is the bustling hub for the city’s residents with fresh fruit, vegetables and seafood being a staple of the diet. We then take one of the classic panoramic lifts of the city and stroll along the streets to admire its unique architecture and art. From graffiti to true masterpieces, there’s inspiration on every street. After a quick bite we ride in the trolley bus to the port, followed by a motorboat excursion around the bay. The port is particularly famous in South America as it was the first hub for Europeans and thus influenced architecture and technology for the rest of the continent. We finish the day with a drink in a sailor’s bar, watching the sun go down to a backdrop of performers in the street dancing to the beat of drums. After a leisurely breakfast at Casa Higueras, which consists of a marvellous spread of local cheese, quince, jamon, avocados and fresh pastries and fruit, we make the short journey back to Santiago via the Casablanca Valley, known globally for it’s crisp white wines. Here you can stop and sample some of the world’s finest chardonnays amongst vineyards that are set against steep mountains. Upon arrival in Santiago we explore the nearby Bohemian district, which is bustling with hip bars and modern tapas focused restaurants. The area is incredibly safe and clean and bursting with music and savvy crowds. We then check in to the cute boutique hotel: Luciano K. Housed in a historic pink art-deco building, this charming hotel has been recently renovated and finished with mod accents, such as marble vanities, and plush velvet. We particularly loved the Pisco Sour welcome cocktail, which is a South American classic. On our final day in Santiago we take a tour that really ties our Chilean experience together. Starting early in the morning, we walk up Cerro Santa Lucia - the city’s centrally located park which has panoramic views over Santiago. Here you can the city in all its splendour, a mix of historic building with French inspiration, mixed with a modern Santiago - all set upon a backdrop of the snow-capped Andes mountain range. We then venture on by luxury transfer to the political centre: La Moneda Palace (presidential offices) and the traditional Plaza de Armas square, a gathering spot for Santiago’s diverse and multicultural expressions. We take a peaceful stroll through the nearby Metropolitan Cathedral which is an ornate building that reflects a pious dedication of the Chilean people to the Catholic church. In fact, 95% of the population consider themselves Catholic and this is evident in their architecture throughout the city. We then venture through the Santiago fish, fruit and vegetable and flower markets. The markets are incredibly multicultural and are a meeting place for people from all over South America, hoping to sell their wares to locals and tourists alike. We finish the tour in the upscale neighbourhood of Barrio Italia browsing furniture stores made by hand by local craftsmen. Here you find an ecclectic mix of restored antiques and original pieces, all very reasonably priced. We have a coffee at a neighbouring hip cafe before retiring for our final evening to Luciano K’s rooftop restaurant for some tapas. As we tuck in to our final empanadas as the sun sets over Santiago, we say gracias Chile for being so charming. We travelled in partnership with Boutique South America. For all tours and itineraries please visit the below website.